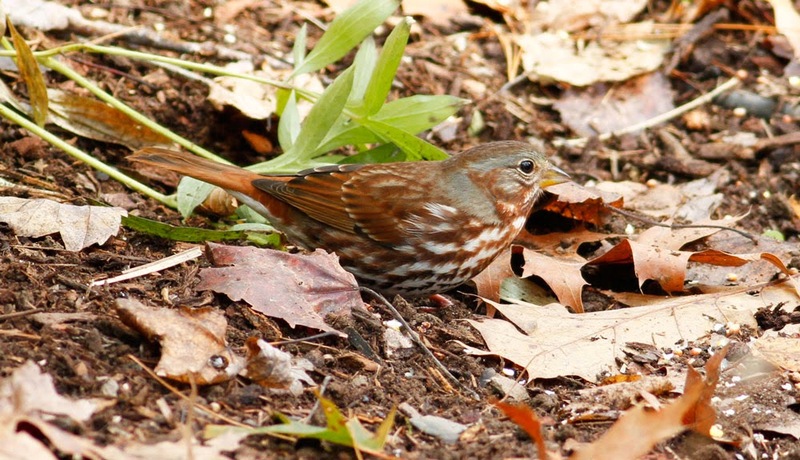 Fox Sparrow - West Northfield yard, Franklin Co., MA. October 31st, 2014. One of two present today, and so nice to have them gracing the yard. 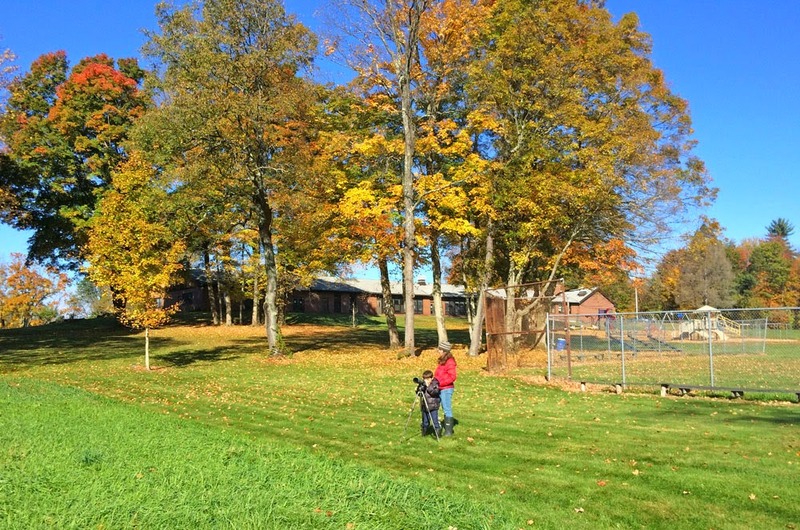 Yet another lovely fall day to be out. This morning I had a quick look at Turner's Falls airfield finding good numbers of Dark-eyed Juncos and with them my first American Tree Sparrow of the fall. 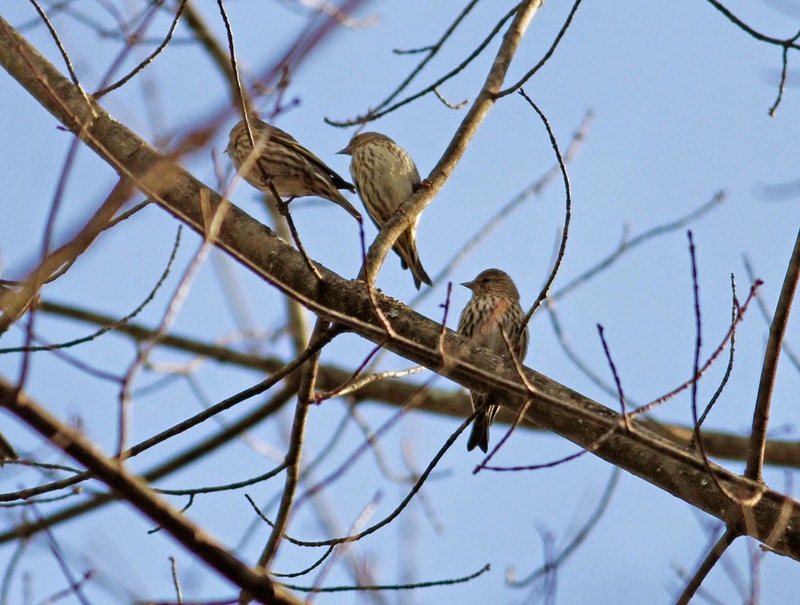 Loosely associating with this flock was a Field Sparrow and a Red-eyed Vireo. 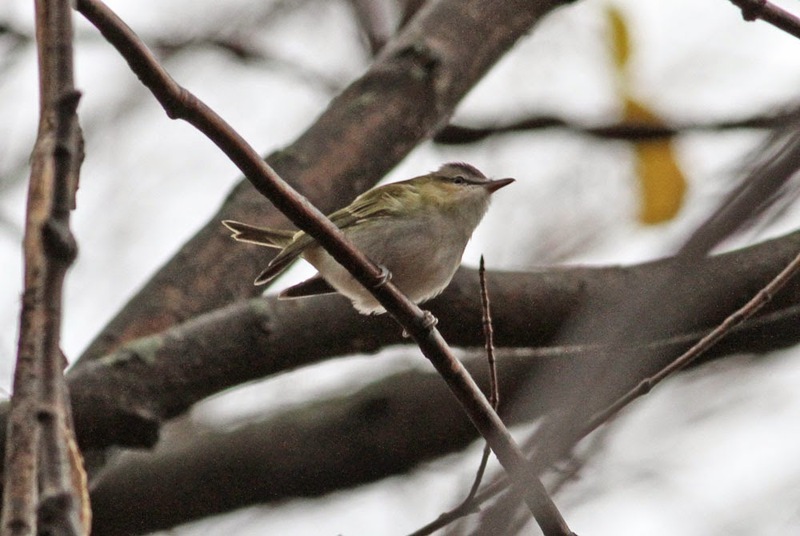 The vireo caught me off-guard being one of the latest I've seen in the Pioneer Valley. A single, calling Snow Bunting also flew over heading west. 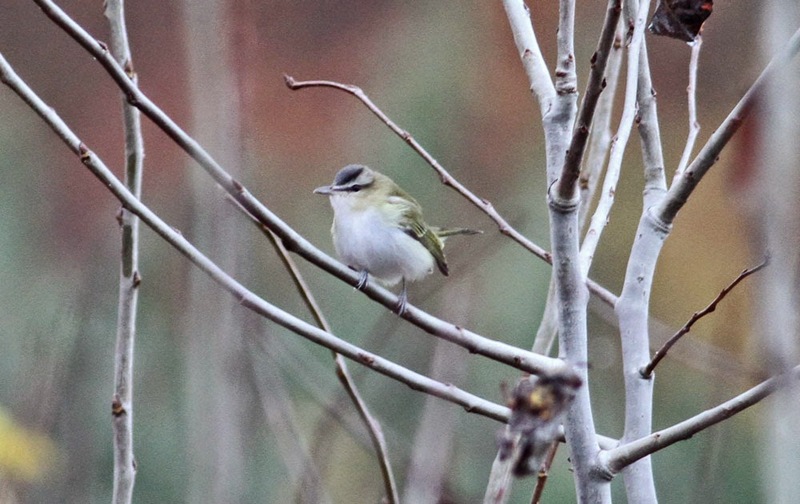 Red-eyed Vireo - edge of Turner's Falls airfield, Franklin Co., MA. October 30th, 2014. 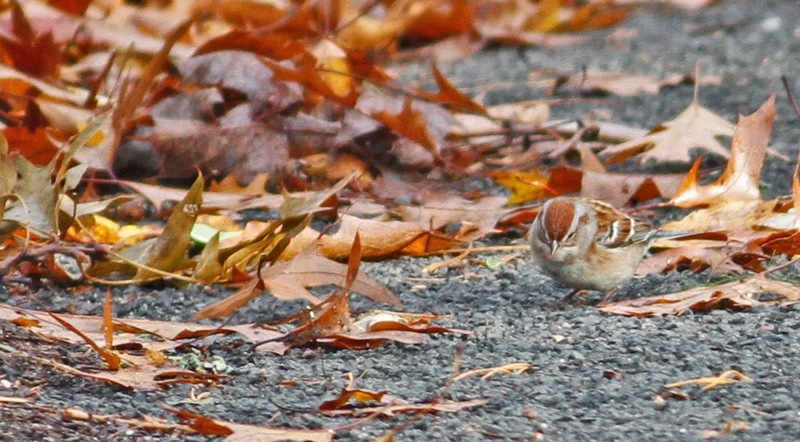 American Tree Sparrow - edge of Turner's Falls airfield, Franklin Co., MA. October 30th, 2014. Ruby-crowned Kinglet - off Rt 2A, Greenfield, Franklin Co., MA. October 30th, 2014. 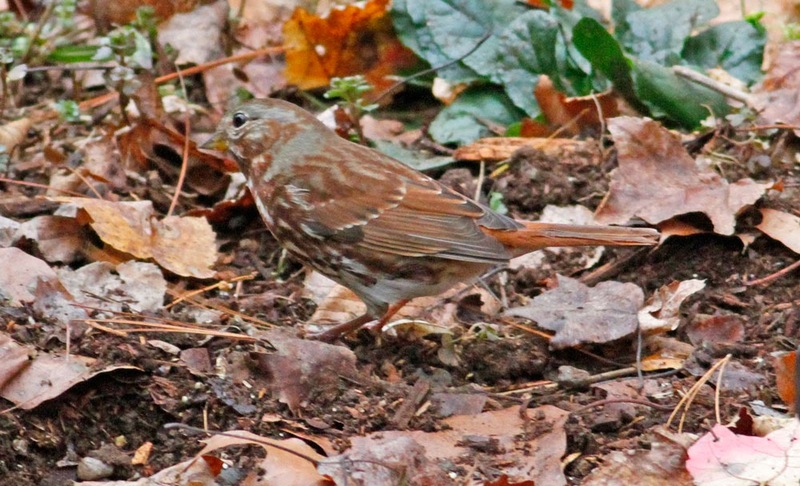 Fox Sparrow - West Northfield yard, Franklin Co., MA. October 29th, 2014. 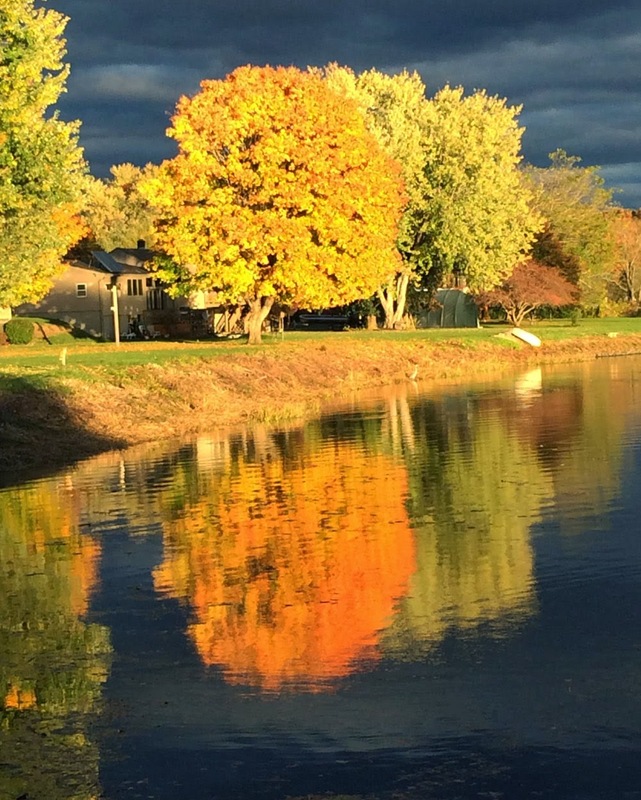 The last two days have been beautifully calm and autumnal. The first was superbly clear with glorious late autumn sunshine while the second was fog-bound until well after noon and a complete contrast to the previous day. Both days produced some nice species as I selected my birding spots between running errands. 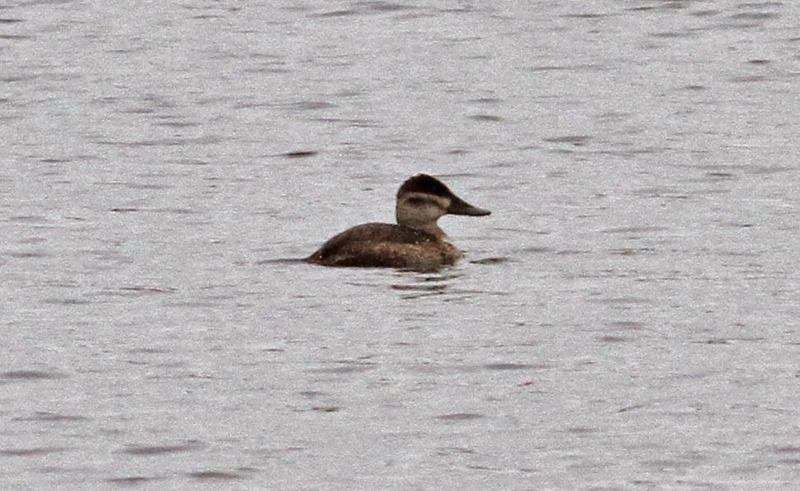 October 28th brought six Horned Grebes to Barton Cove as well as a fly-over Snow Bunting and 5 Ring-necked Ducks. At the power canal, two, possibly three Cackling Geese were present in the afternoon including the continuing bird for its fifth straight day. A female Northern Pintail appeared all too briefly amid the Canada Geese before disappearing downstream. 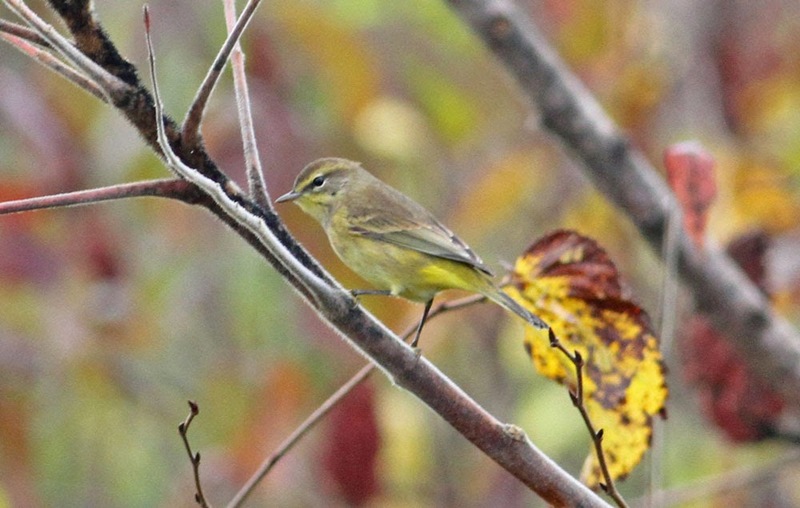 The next day was heavily shrouded in fog but still had some good species in the woodland edges at Barton Cove including several Golden-crowned Kinglets, ten plus Yellow-rumped Warblers, a late Blackpoll Warbler, a calling Red-breasted Nuthatch (seem scarce this fall) and a perky Winter Wren. 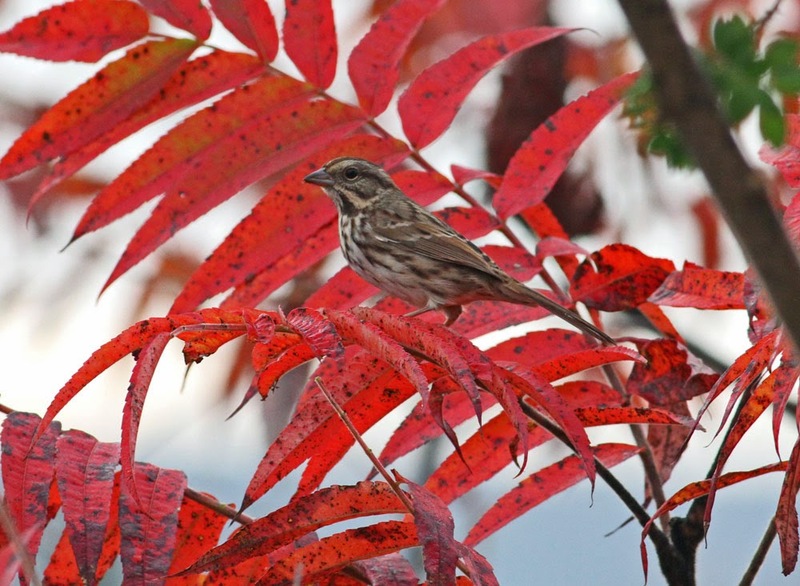 Late afternoon was dark and gloomy but brightened up considerably by a super 'Red' Fox Sparrow - the first at our new place in West Northfield, even bursting into song a couple of times toward dusk. Horned Grebes - Barton Cove, Gill, Franklin Co., MA. October 28th, 2014. 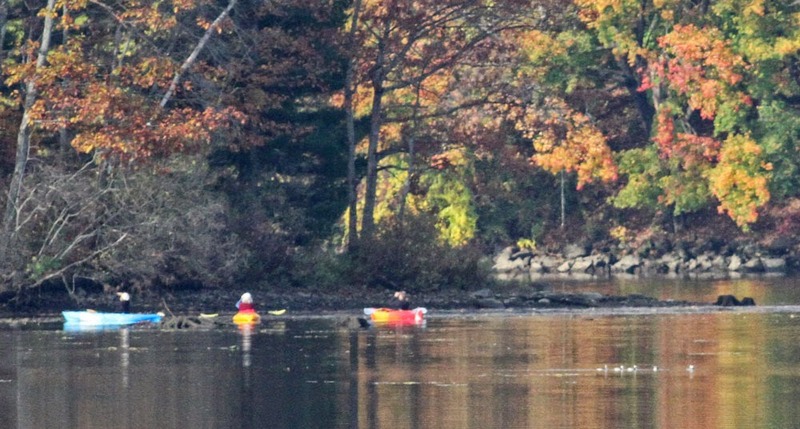 Seems like the best way to get close to these grebes is by kayak! The shot below is a very heavy crop of the same group of six Horned Grebes. Cackling Goose (center) - Turner's Falls power canal, Franklin Co., MA. October 28th, 2014. My second of the fall at this location. Less 'frosty' looking than the previous individual with a lot more buff to the breast color and narrower pale fringes to the upperparts. Again on the large side for a Cackling Goose but note the completely different head and bill shape compared to the surrounding Canadas. 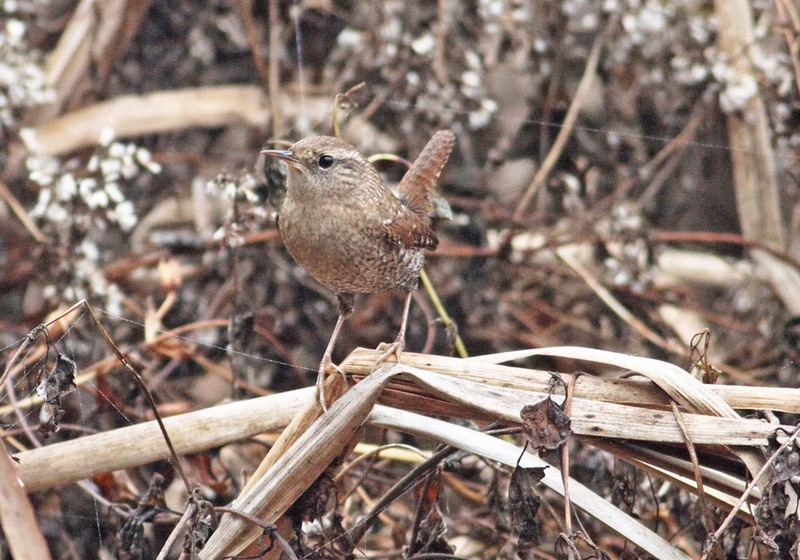 Winter Wren Troglodytes hiemalis - Barton Cove, Gill, Franklin Co., MA. October 29th, 2014. Not too uncommon around Gill but views like this are few and far between with most of my observations going down as 'heard only'. 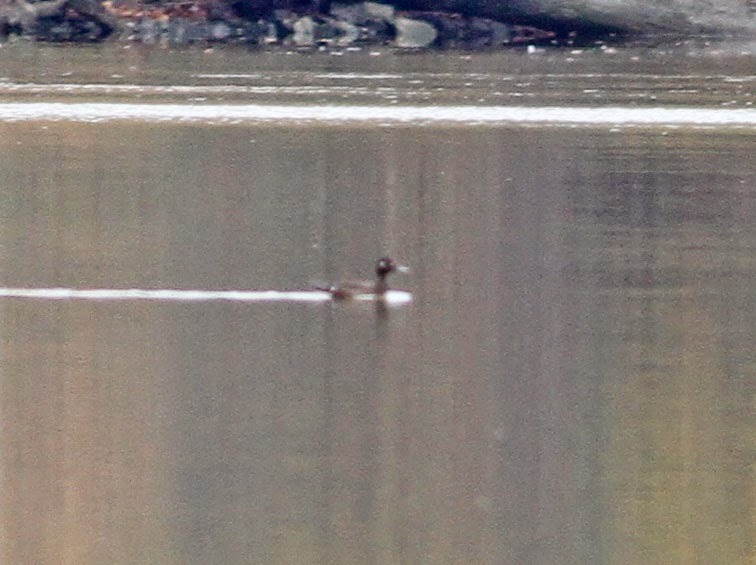 Northern Pintail (center) - female-type, Turner's Falls power canal, Franklin Co., MA. October 28th, 2014. 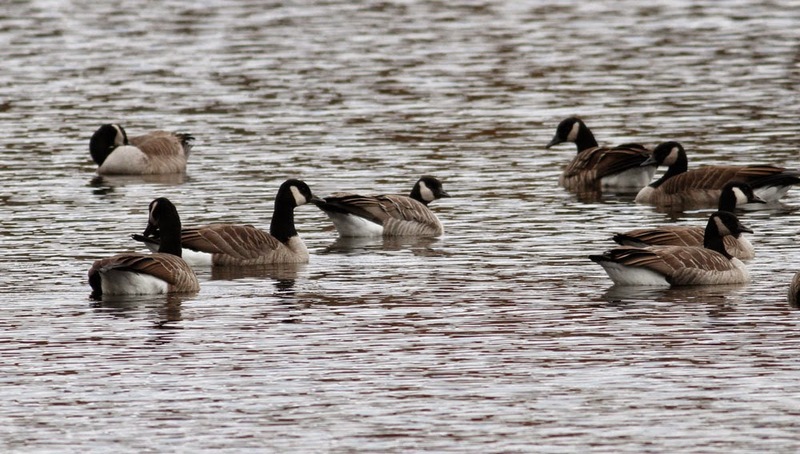 Nice to see last Friday's Cackling Goose continuing today at the Turner's Falls power canal. Saw the same bird yesterday as well with a handful of Canada Geese. 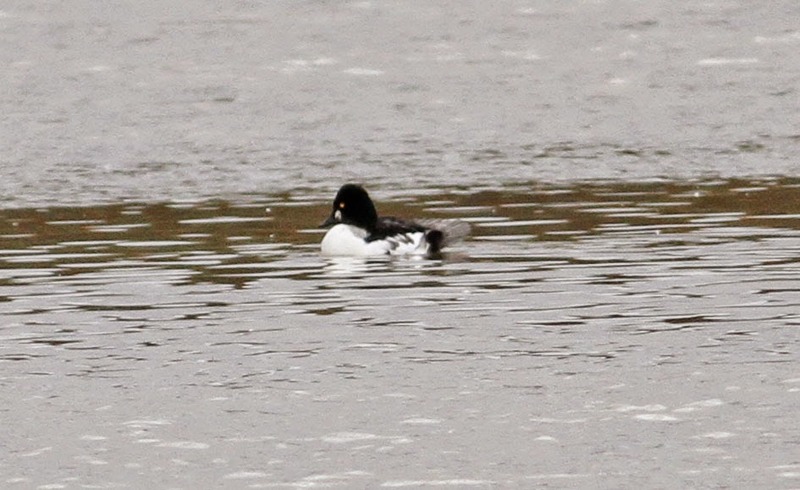 Numbers of diving ducks remain quite small at Turner's with three Common Goldeneye, 2 Bufflehead and a Ruddy Duck continuing at the power canal today. As usual, I didn't get a lot birding done over the weekend but a couple of notables included a male Eastern Towhee in our new yard in Northfield, and an apparent maxima Canada Goose in a stubble field off Route 5 in Bernardston. 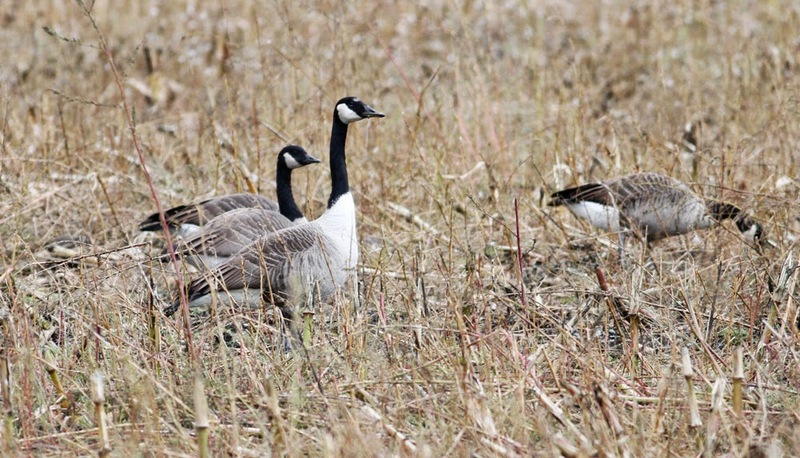 Cackling Goose (left most bird) - typical example of hutchinsii (Richardson's), looking strikingly pale and small in the field among Canada Geese. Overall pallid, gray cast with broad, whitish fringes to upperpart feathers. Notably ''boxy' head shape with small bill and often appeared neckless. Turner's Falls power canal Franklin Co. MA. October 27th, 2014. 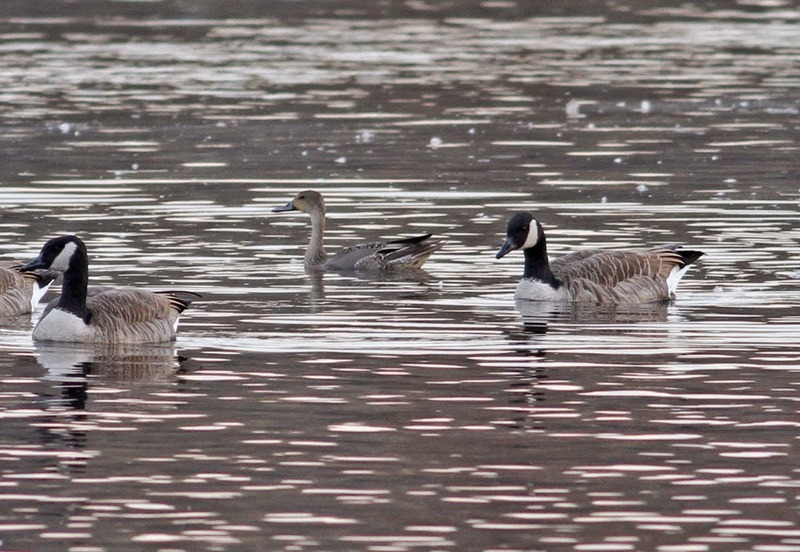 Cackling Goose (center) - hutchinsii (Richardson's). Different day, different light. 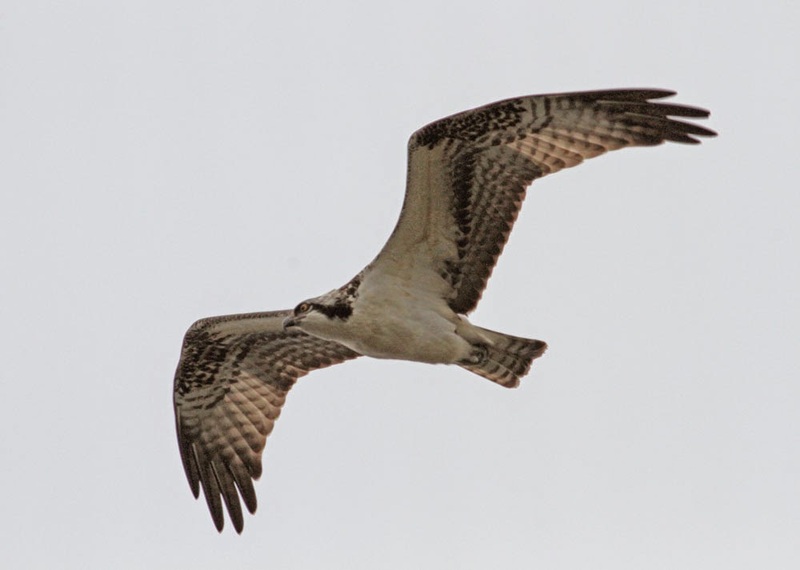 Same bird as above at the same location but photographed under completely overcast skies. Turner's Falls power canal Franklin Co. MA. October 26th, 2014. Canada Goose - showing characteristics of the maxima form (aka 'Giant' Canada Goose), Bernardston, Franklin Co., MA. October 26th, 2014. Eastern Towhee (male) - West Northfield, Franklin Co., MA. October 26th, 2014. 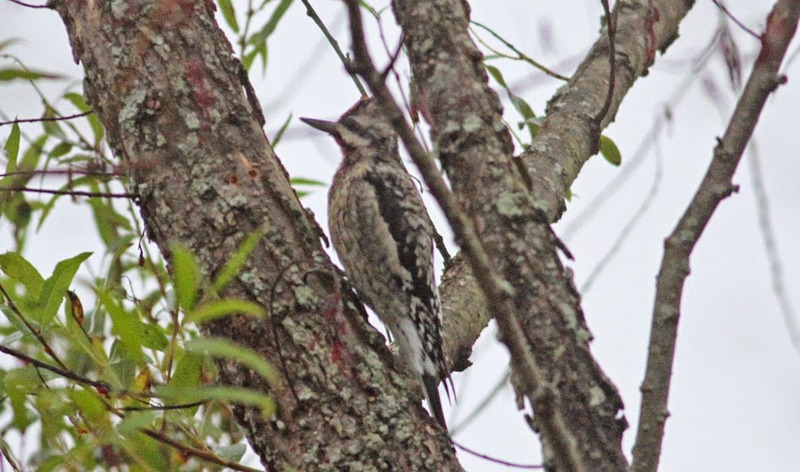 Getting late for this species in Western MA and the second consecutive day that it visited our new yard. This morning I spent a very pleasant ninety minutes exploring the nature trail in the grounds of Gill Elementary School. The temperature was cool (below 50 F) with a brisk WNW breeze. 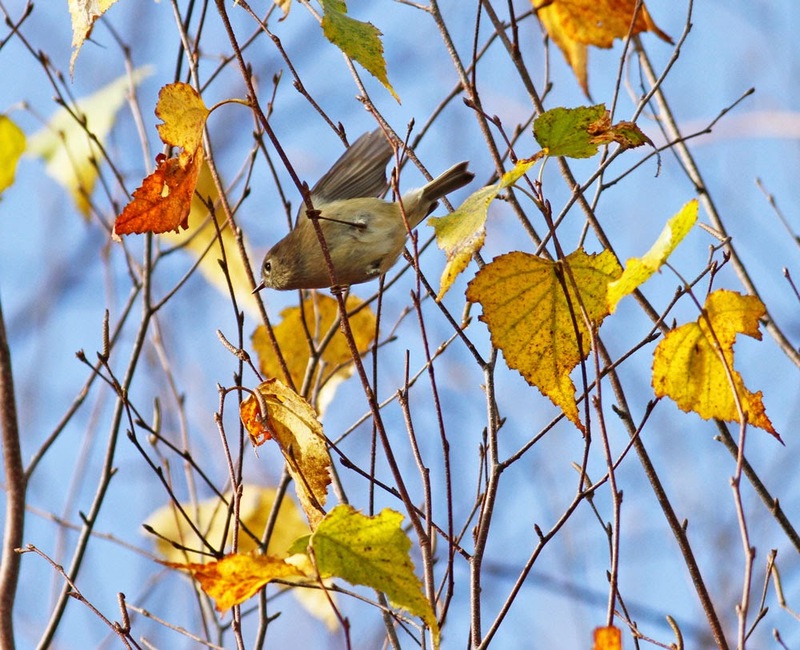 Diversity was down from my attempt at a Big Sit on October 12th, as might be expected with the departure of migrant warblers, vireos and sparrows. The weedy fields had also been ploughed over providing feeding for a decent sized flock of 51 American Pipits. 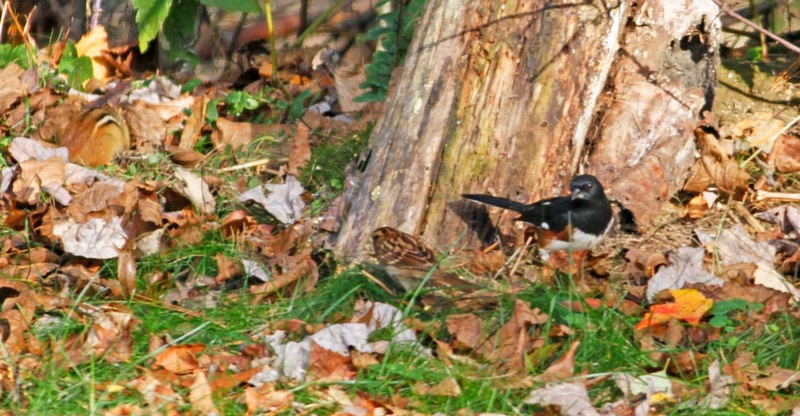 Otherwise, it was a morning to enjoy the common woodland birds of which there are plenty in the heavily wooded parts on the nature trail. Sharp-shinned Hawk - juvenile, Gill Elementary School Nature Trail, Franklin Co., MA. October 27th, 2014. Pine Siskins - Gill Elementary School Nature Trail, Franklin Co., MA. October 27th, 2014. Black-capped Chickadee - Gill Elementary School Nature Trail, Franklin Co., MA. October 27th, 2014. 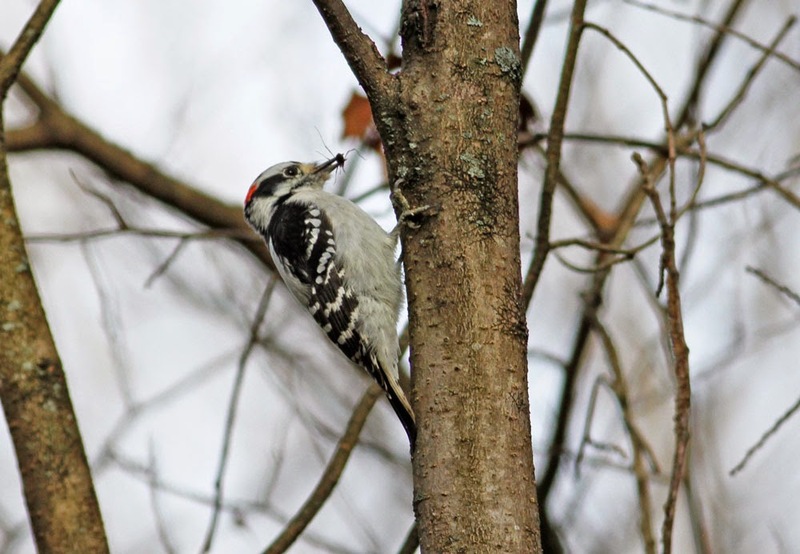 Downy Woodpecker - male, Gill Elementary School Nature Trail, Franklin Co., MA. October 27th, 2014. 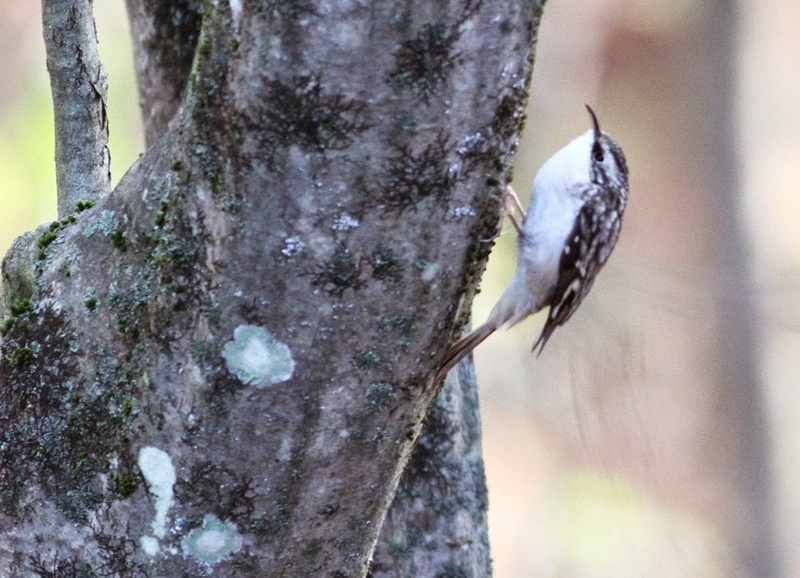 Brown Creeper -Gill Elementary School Nature Trail, Franklin Co., MA. October 27th, 2014. One of my favorites of the morning, this one showing especially well. It's been a slightly chaotic week as we're in the middle of moving house, so lots of disruption and poor/non-existent access to the internet. Hopefully I can get back into the swing of more regular updates, especially since there's been plenty of action in the field with more to come. Here's some images from the week Oct 17th - 23rd. They were all taken in the Connecticut River Valley between Turner's Falls and Northfield. 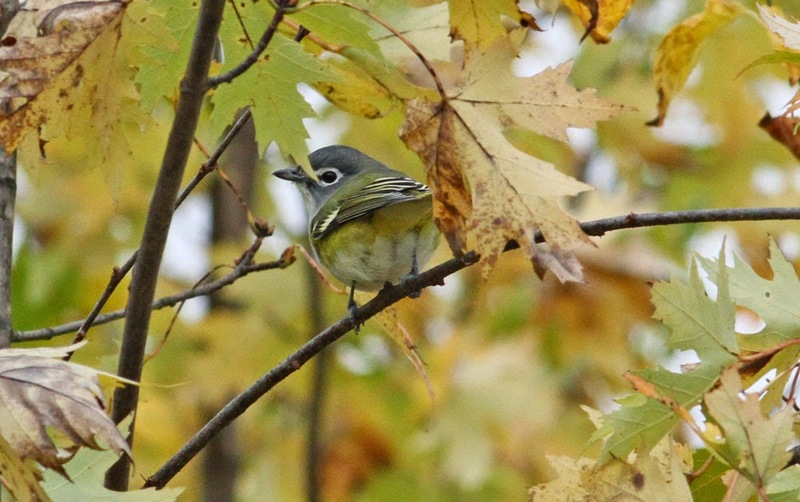 Blue-headed Vireo - Turner's Falls power canal, Franklin Co., MA. October 21st, 2014. Common Yellowthroat - Northfield Meadows, Northfield, Franklin Co., MA. October 17th, 2014. 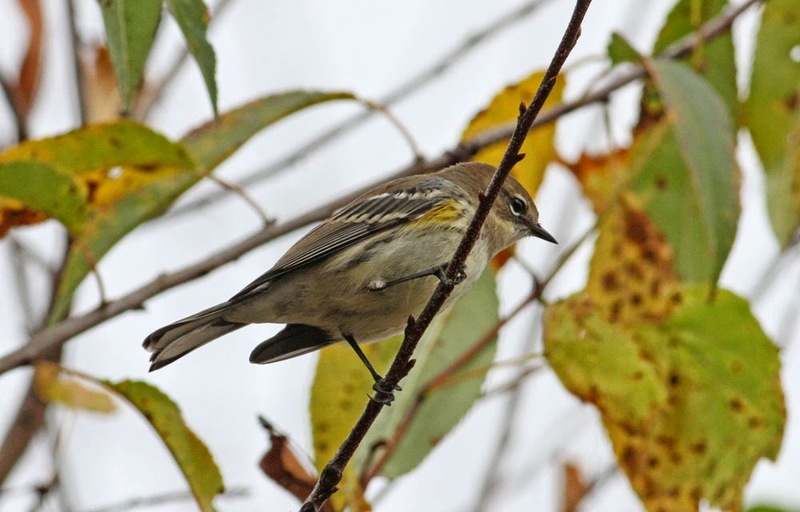 Yellow-rumped Warbler - Turner's Falls power canal, Franklin Co., MA. October 21st, 2014. 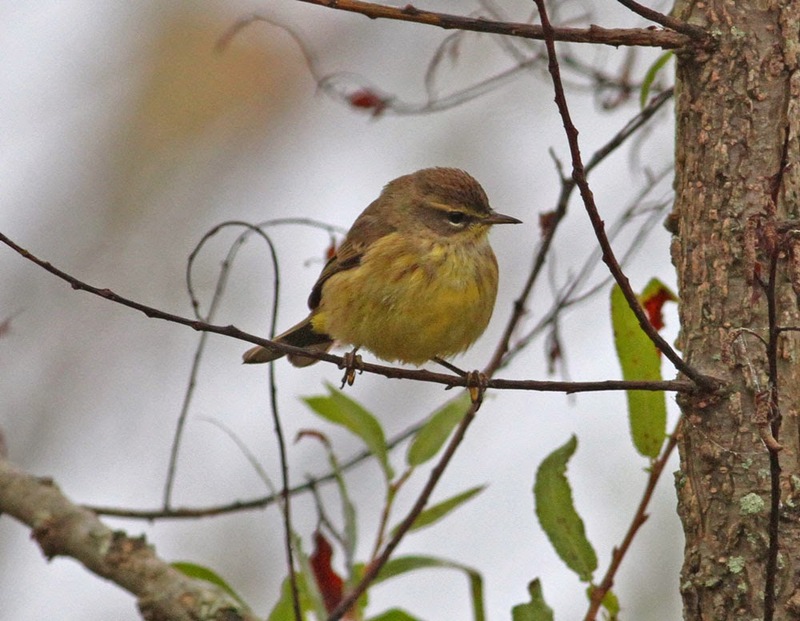 (Eastern) Palm Warbler - Turner's Falls power canal, Franklin Co., MA. October 21st, 2014. 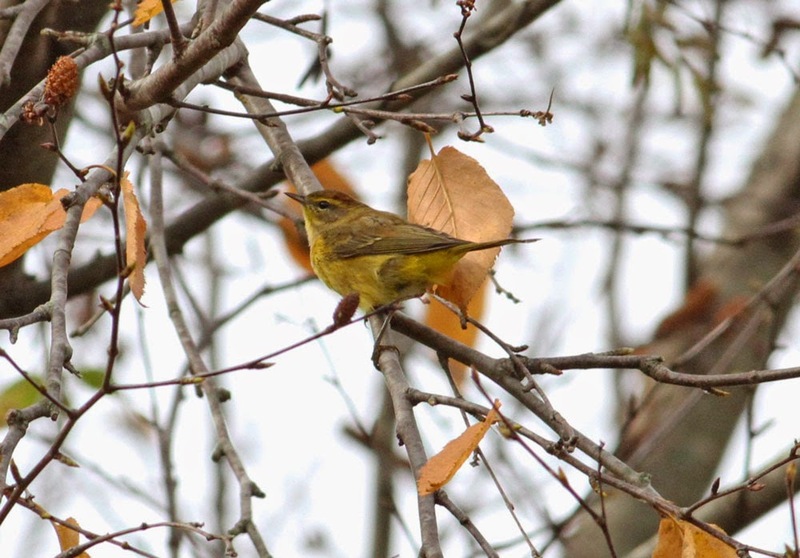 (Eastern) Palm Warbler - Northfield Meadows, Northfield, Franklin Co., MA. October 17th, 2014. 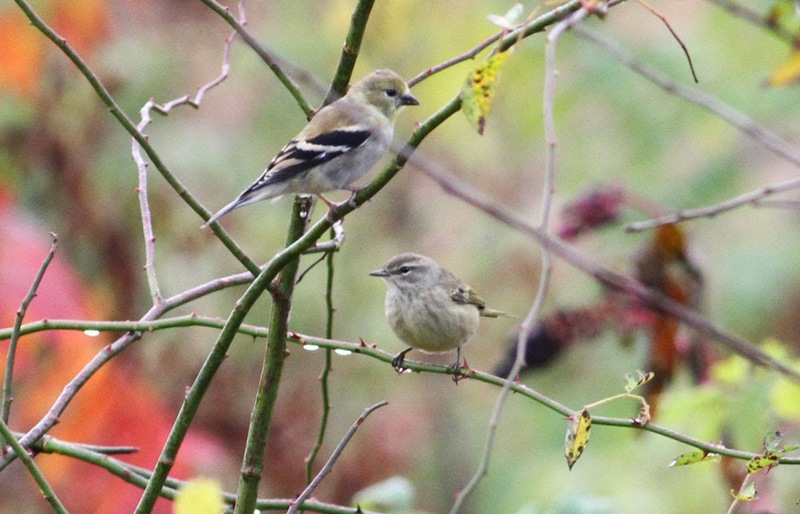 American Goldfinch and (Western) Palm Warbler - Northfield Meadows, Northfield, Franklin Co., MA. October 17th, 2014. Savannah and White-crowned Sparrows - Northfield Meadows, Northfield, Franklin Co., MA. October 17th, 2014. 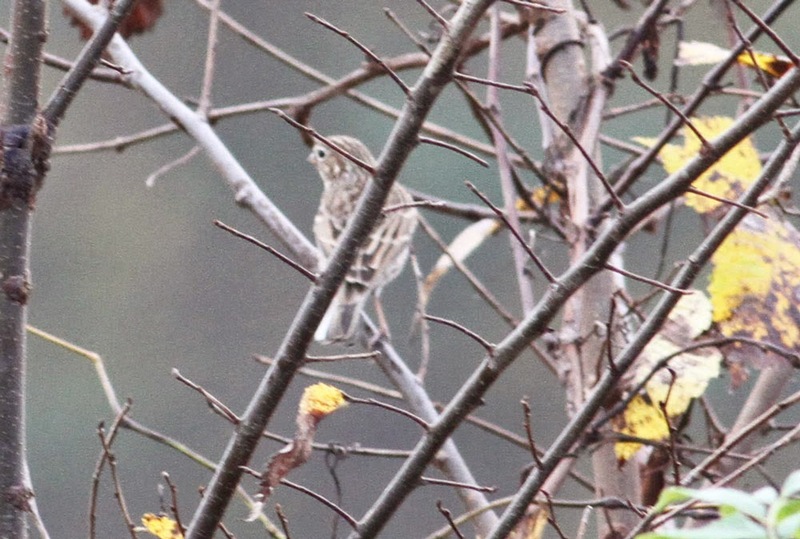 Vesper Sparrow - Northfield Meadows, Northfield, Franklin Co., MA. October 17th, 2014. Song Sparrow - Northfield Meadows, Northfield, Franklin Co., MA. October 17th, 2014. 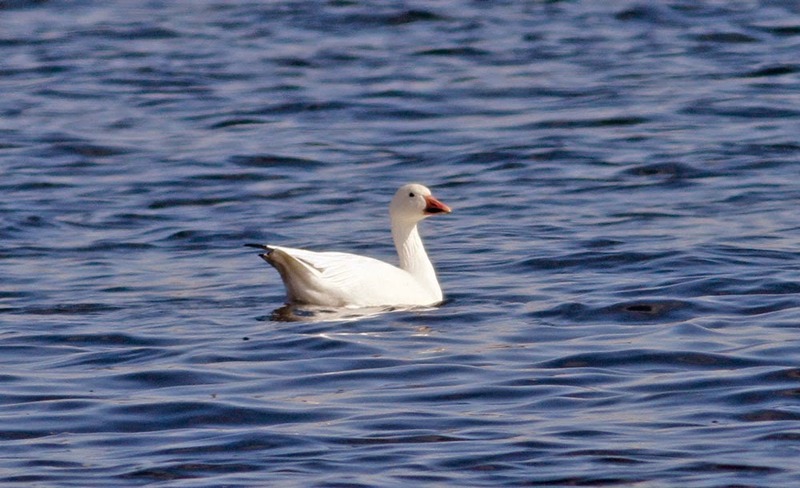 Snow Goose - Turner's Falls power canal, Franklin Co., MA. October 20th, 2014. 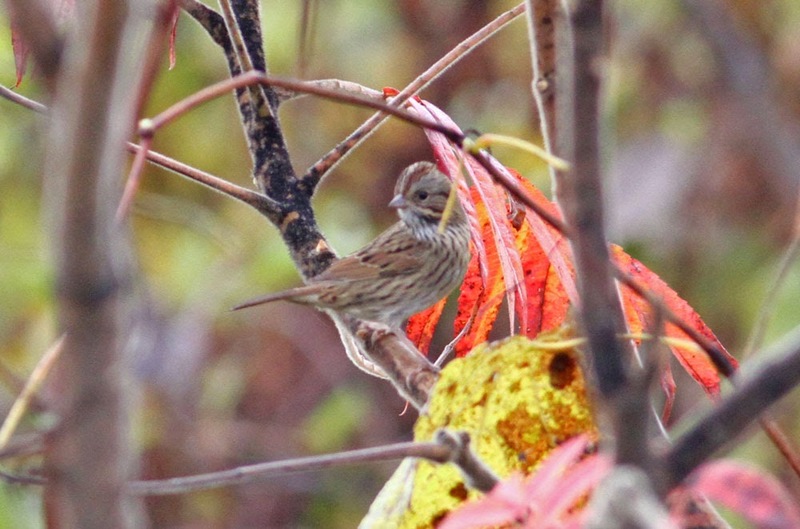 Lincoln's Sparrow - Northfield Meadows, Northfield, Franklin Co., MA. October 17th, 2014. 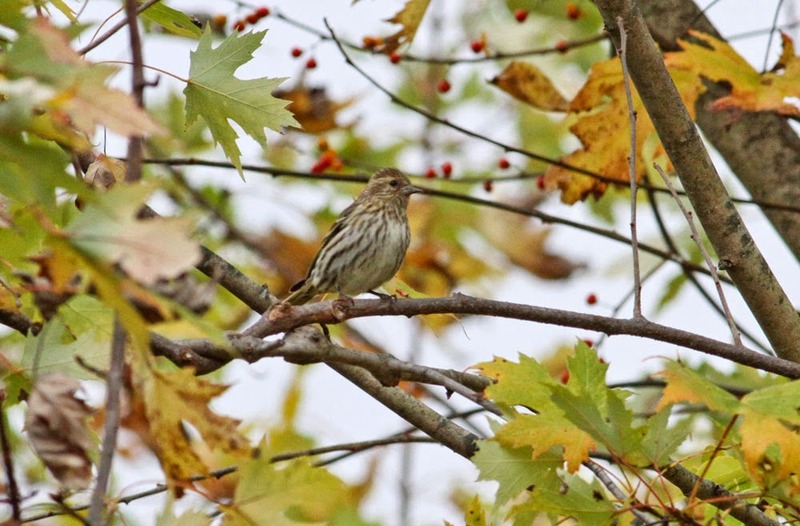 Pine Siskin - Turner's Falls power canal, Franklin Co., MA. October 21st, 2014. Ruddy Duck - Turner's Falls power canal, Franklin Co., MA. October 21st, 2014. 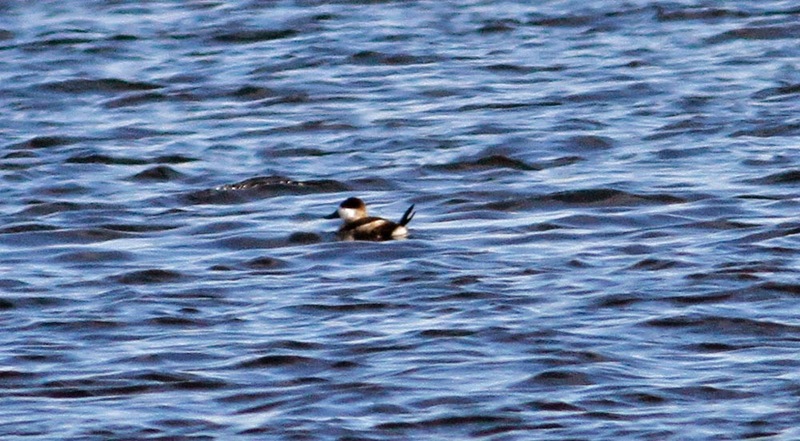 Ruddy Duck - Turner's Falls power canal, Franklin Co., MA. October 20th, 2014. Pileated Woodpecker - Northfield Meadows, Northfield, Franklin Co., MA. October 17th, 2014. Riverview Drive, Gill, Franklin Co., MA. October 21st, 2014. 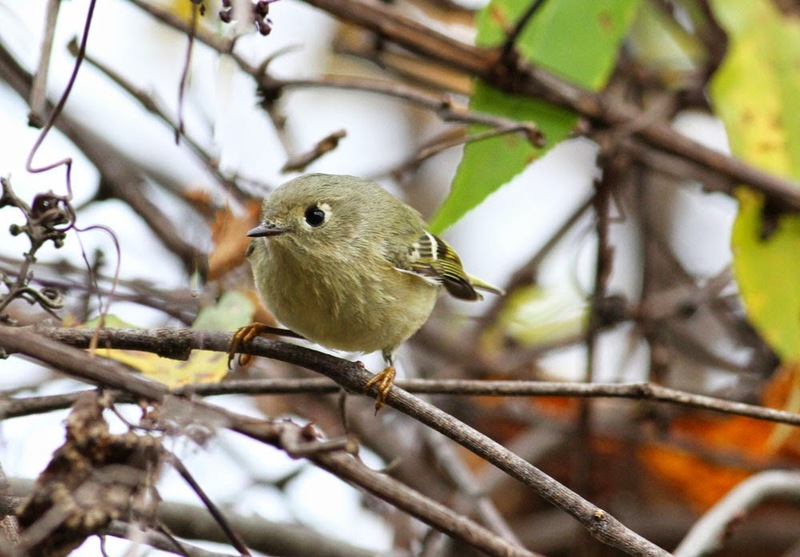 Ruby-crowed Kinglet - Turner's Falls power canal, Franklin Co., MA. October 21st, 2014. This morning I made a couple of brief stops in between errands. A warm frontal system brought heavy showers and rain, and I had a quick look at Barton Cove ever hopeful that the storm might produce something of interest. One Pied-billed Grebe continued but little else was present. The Turner's Falls power canal, or rather the wooded edges of the power canal, proved more interesting with a small flock of Yellow-rumped Warblers producing a 'getting late' Magnolia Warbler that appeared all too briefly....Eastern Phoebes and Gray Catbirds also associated with this flock. 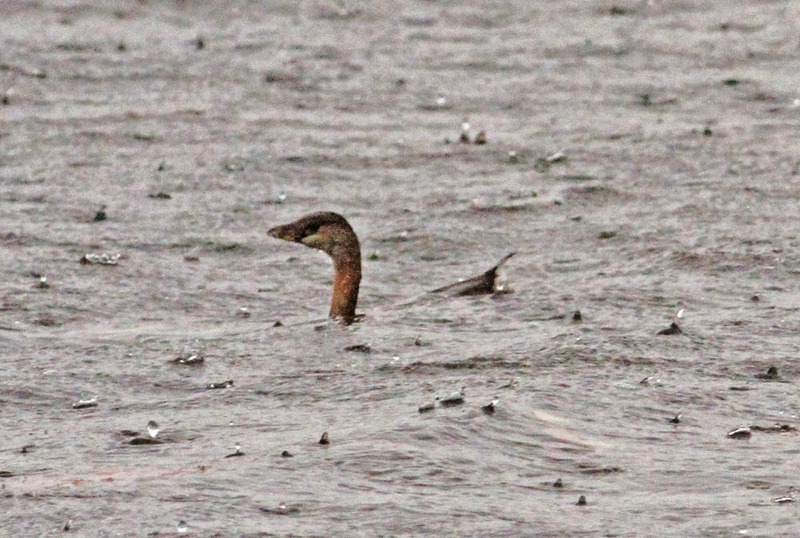 Pied-billed Grebe in downpour - Barton Cove, Gill, Franklin Co., MA. October 16th, 2014. Magnolia Warbler - distant, out of focus and about to drop out of view....but still showing the unique tail and underside pattern with a thick black tip to the crisp white undertail, vent and lower belly combined with bright yellow flanks and belly, Can any other North American passerine match this pattern? By the way, I had clean looks at the bird before attempting to take a shot. 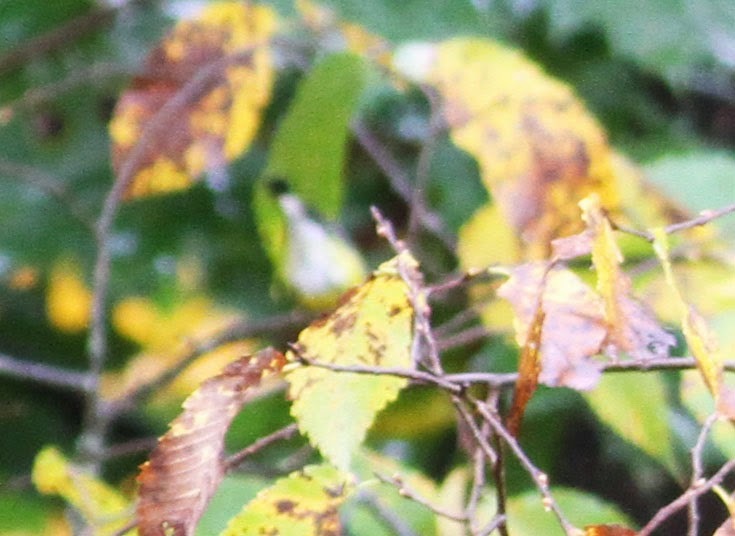 It was about 25 meters away and the auto-focus picked up the foliage rather than the bird.....and then it was gone. Matan and Susannah arrive at the station - Gill Elementary School, Franklin Co., MA. October 12th, 2014. After a foggy start the day turned glorious - what a magical spot for a Big Sit! Overall I was extremely impressed by the diversity of species at Gill Elementary, recording 58 species between 06:15 - 12:15 hours. 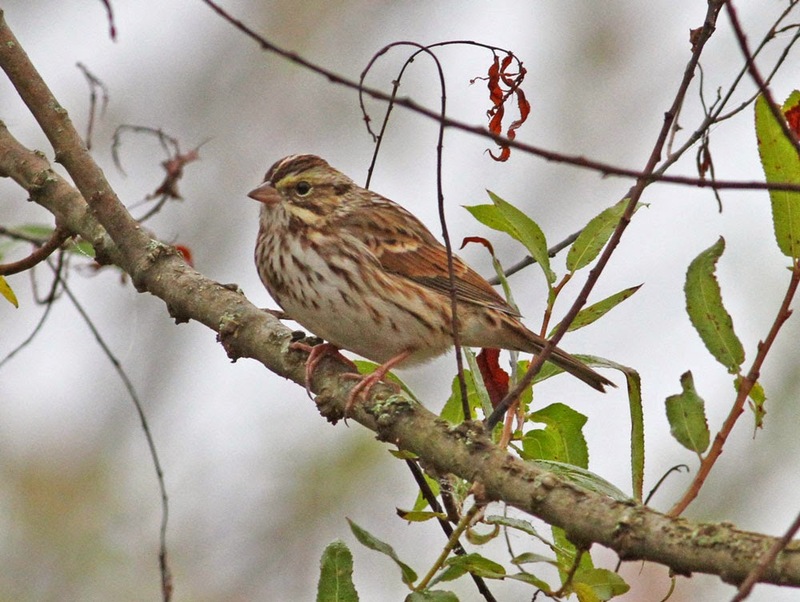 2) Song Sparrow - 105 (first heard at 06:26hrs. 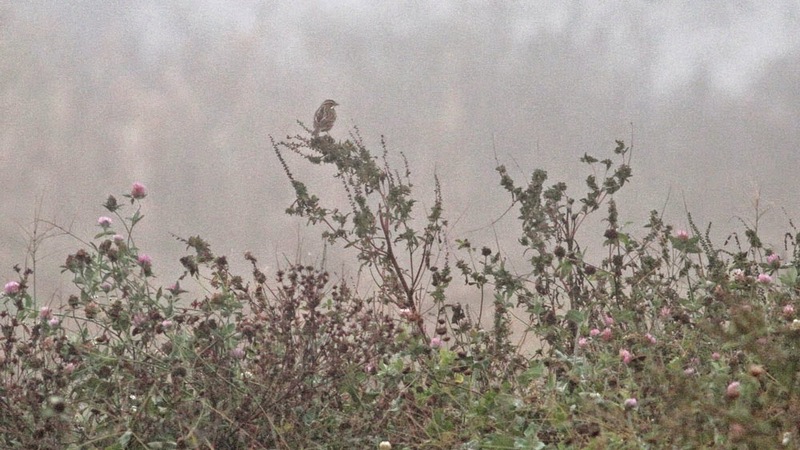 The fields and scrubby-fringes south-east of the station were full of sparrows). 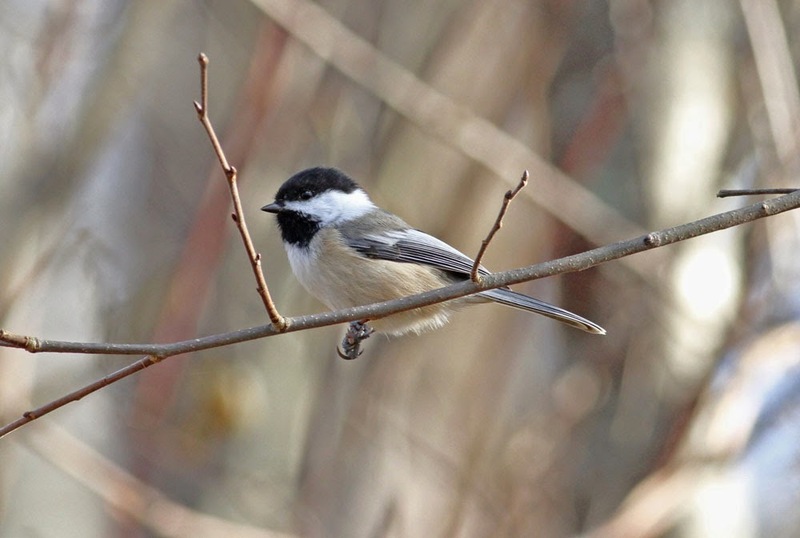 3) Black-capped Chickadee - 15 (including two small parties of high flying migrants). White-throated Sparrow - Gill Elementary School, Franklin Co., MA. October 12th, 2014. 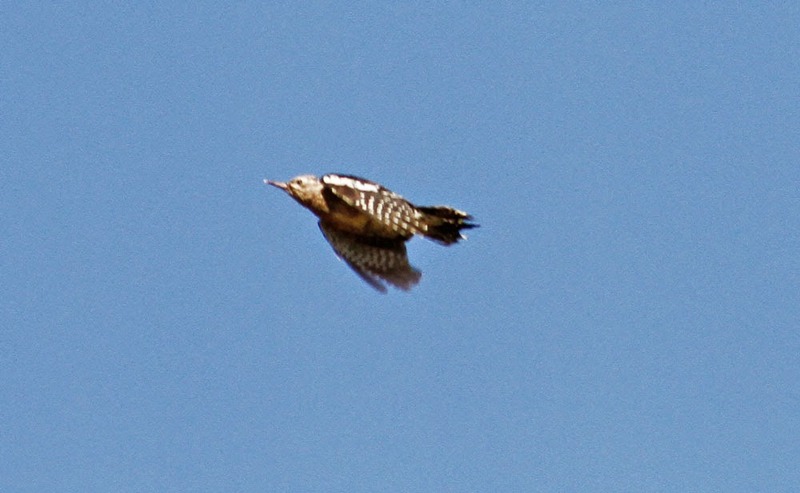 5) American Woodcock - 1 (nice, close fly past of bird giving 'twitter' display flight at 06:33 hrs). 10) Blue Jay - 7 on site plus nice migration of small parties totaling 64 moving WSW after the fog cleared. Blue Jay - Gill Elementary School, Franklin Co., MA. October 12th, 2014. 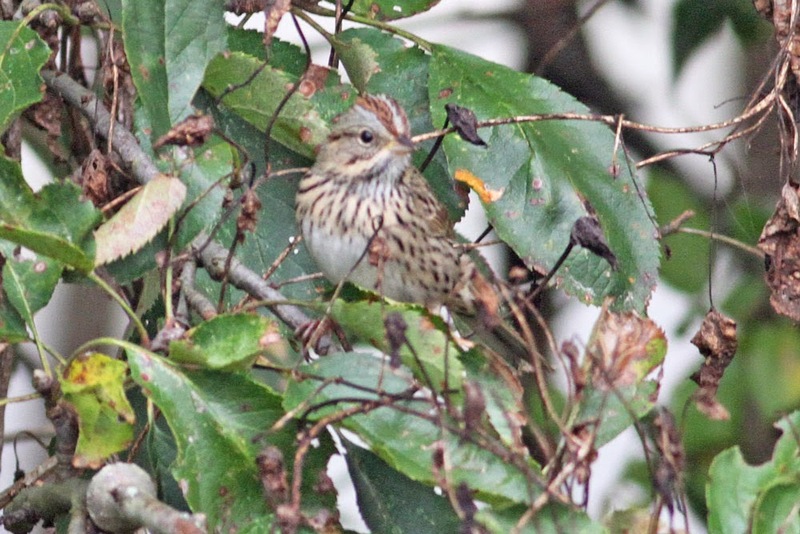 One of the many migrants passing over the station today. 14) Barred Owl - 1 called at 06:47 hrs - giving single "whooo-aaw" call. 20) Canada Goose - 750 moving WSW after fog cleared. Likely heading for Turner's Falls. Yellow-bellied Sapsucker - Gill Elementary School, Franklin Co., MA. October 12th, 2014. Juvenile in the willows close the station in the morning fog. 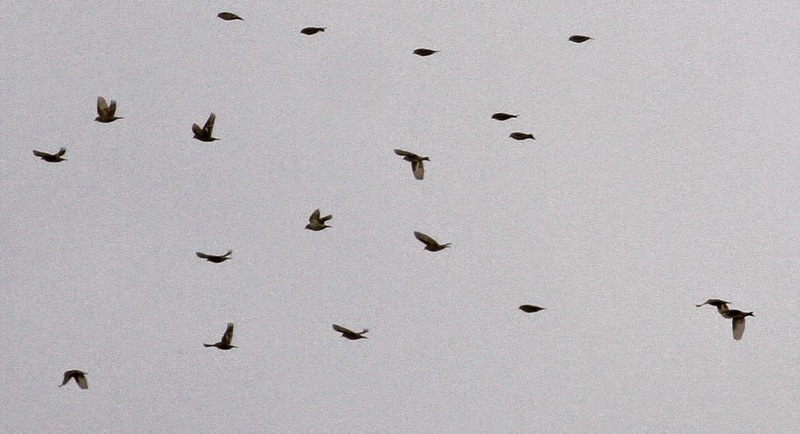 A second completely different bird migrated past the station in late morning, featured below. Savannah Sparrows - Gill Elementary School, Franklin Co., MA. October 12th, 2014. Upper bird photographed by the station, lower, distant bird in the early morning mist. 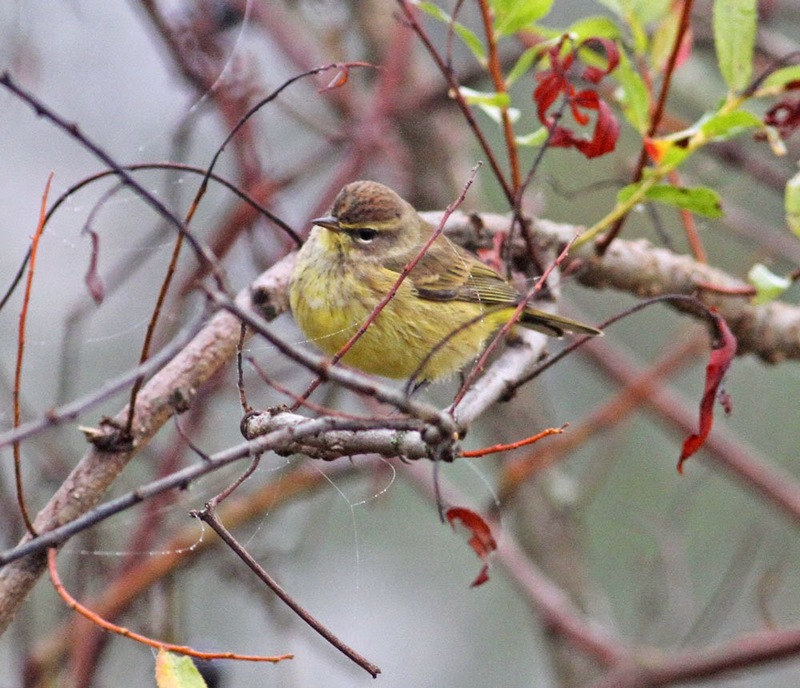 32) Palm Warbler - 5 (4 eastern, 1 western). (Eastern) Palm Warblers - Gill Elementary School, Franklin Co., MA. October 12th, 2014. Lincoln's Sparrow - Gill Elementary School, Franklin Co., MA. October 12th, 2014. 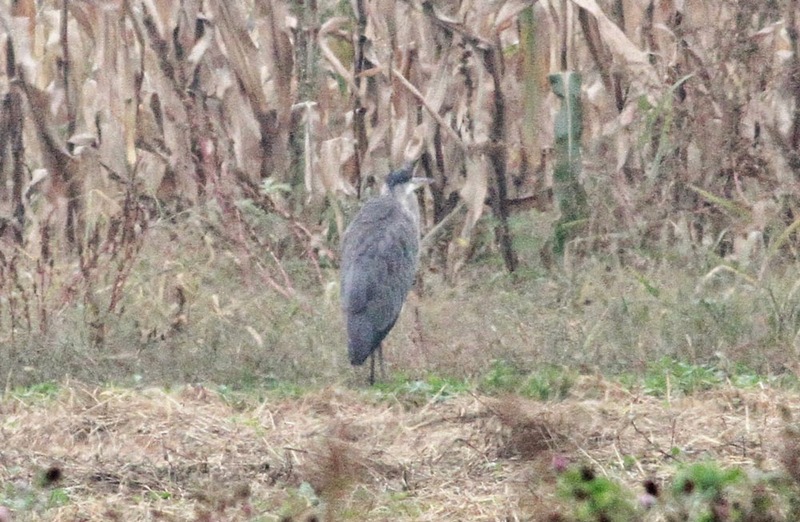 36) Great Blue Heron - 1 foraging in corn field. Great Blue Heron - Gill Elementary School, Franklin Co., MA. October 12th, 2014. 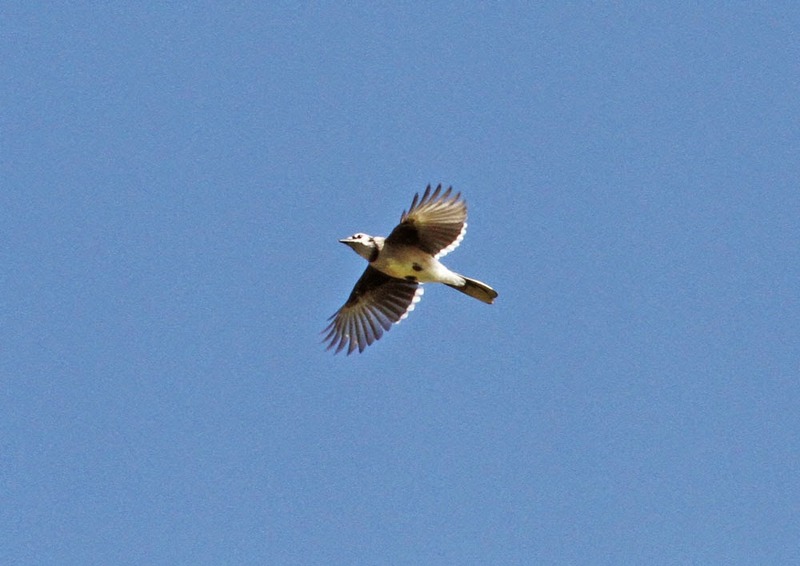 37) Belted Kingfisher - 1 in flight over woodland at 09:30hrs. 38) Rusty Blackbird - 2 (calling) moving WNW at 09:35hrs. Rusty Blackbird - Gill Elementary School, Franklin Co., MA. October 12th, 2014. 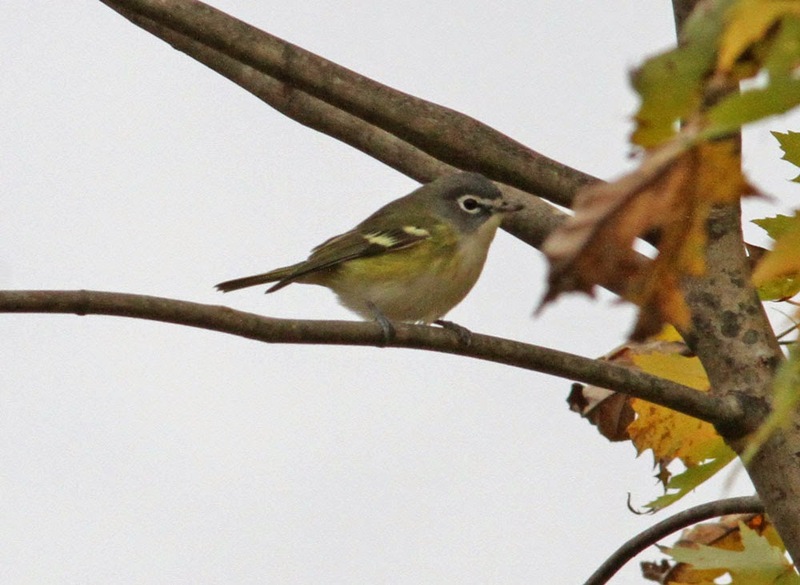 40) vireo sp.- Philadelphia? Heard singing several times, sounded most like this species but given the late date, a visual would have been preferred for confirmation. 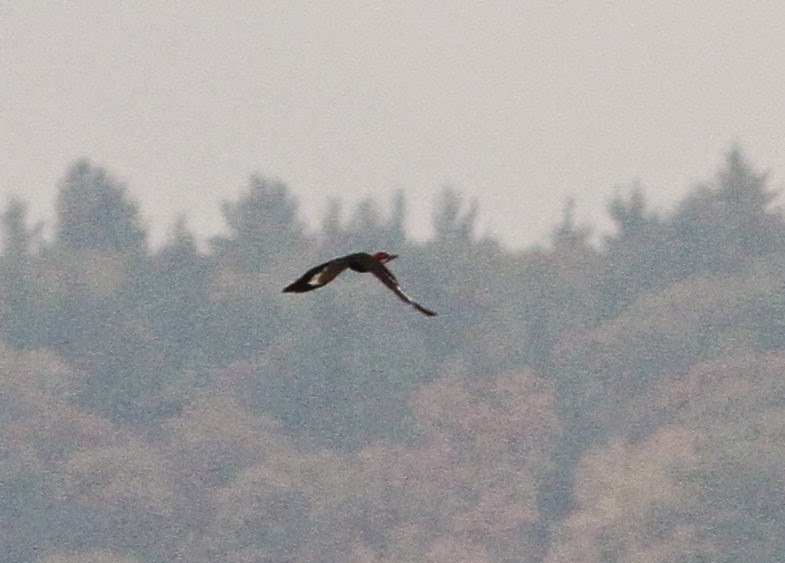 42) Turkey Vulture - Up to 12 loafing around the valley once the fog cleared at 10am. 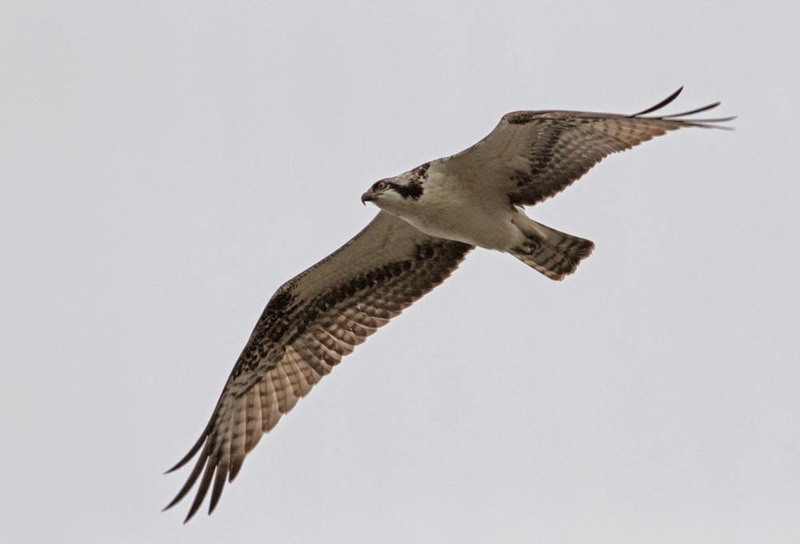 44) Red-tailed Hawk - 7 - possibly involving a few migrants. 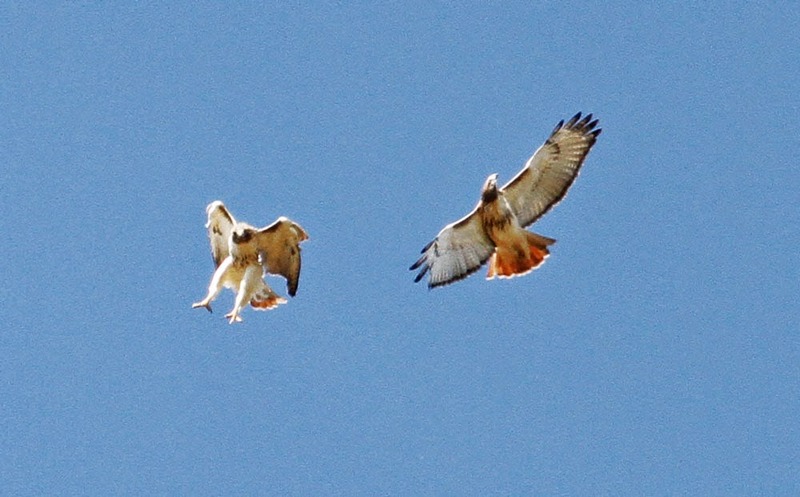 Red-tailed Hawks - Gill Elementary School, Franklin Co., MA. October 12th, 2014. Nice interaction right over the station! 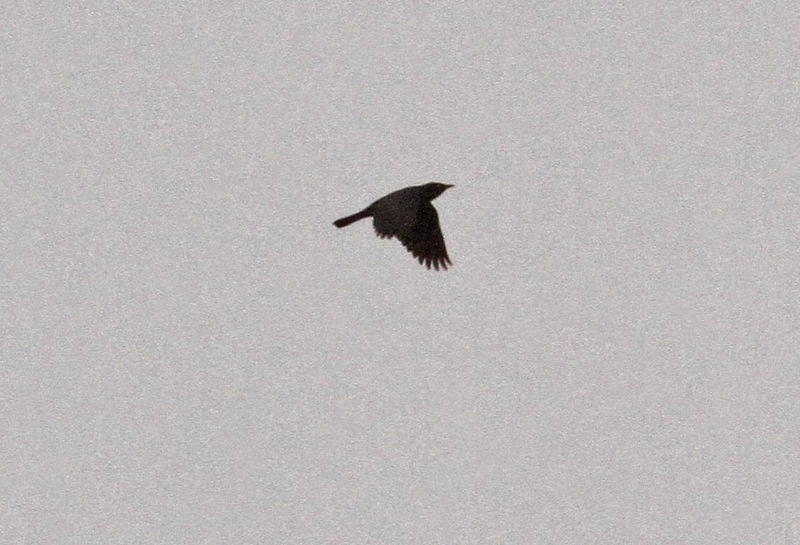 46) Common Raven - 1 soaring with Bald Eagle at 10:52hrs. 48) Red-shouldered Hawk - 2 (adult moving W at 11:07hrs and another adult moving WSW at 12:14hrs.) One of the highlights of the morning. 51) American Kestrel - 1 (moving W at 11:10hrs). 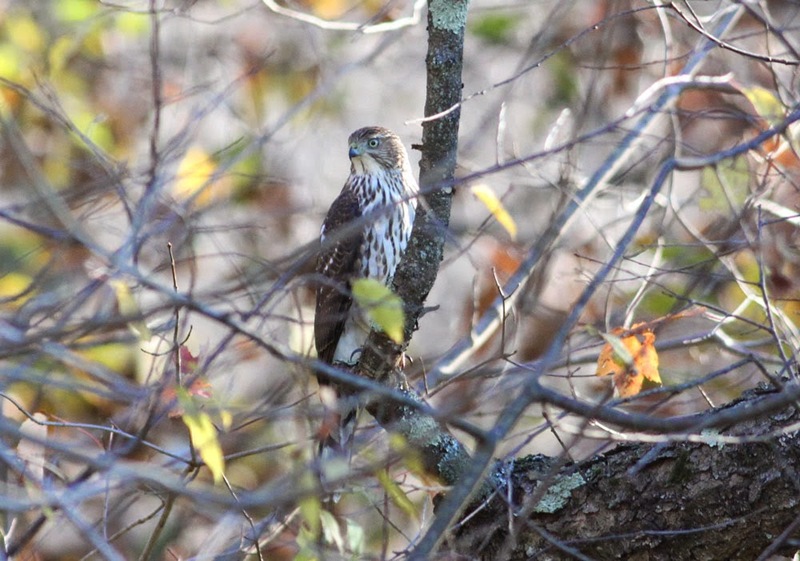 52) Sharp-shinned Hawk - 7, all moving WSW. 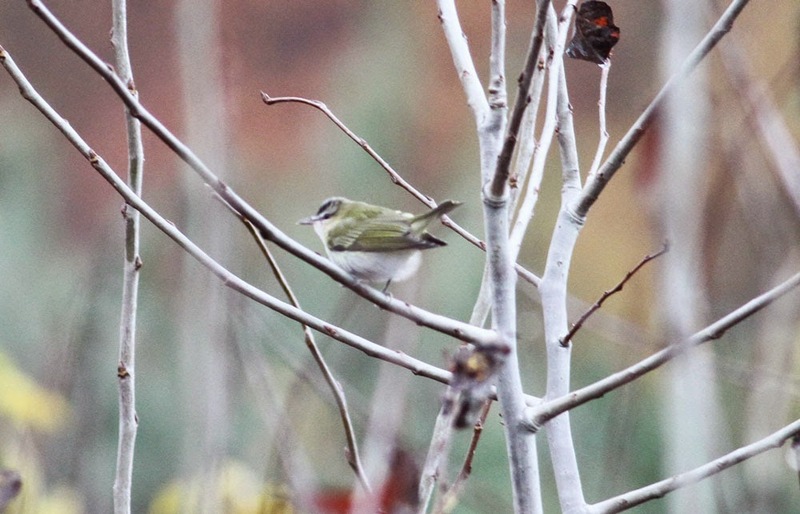 53) Blue-headed Vireo - 1 giving 'rattle' calls at 11:44hrs. 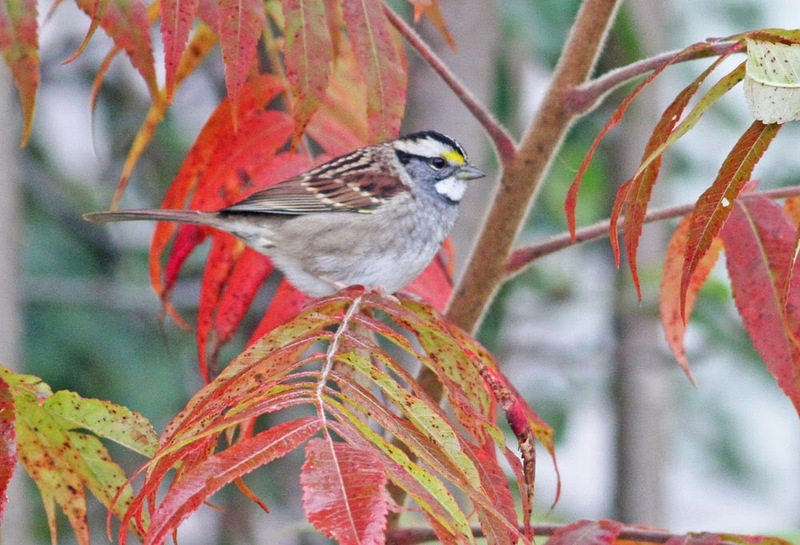 55) White-crowned Sparrow - 1 singing within sparrow flock at 11:52hrs. 56) Feral Rock Dove - 1 (late appearance of just one bird!). 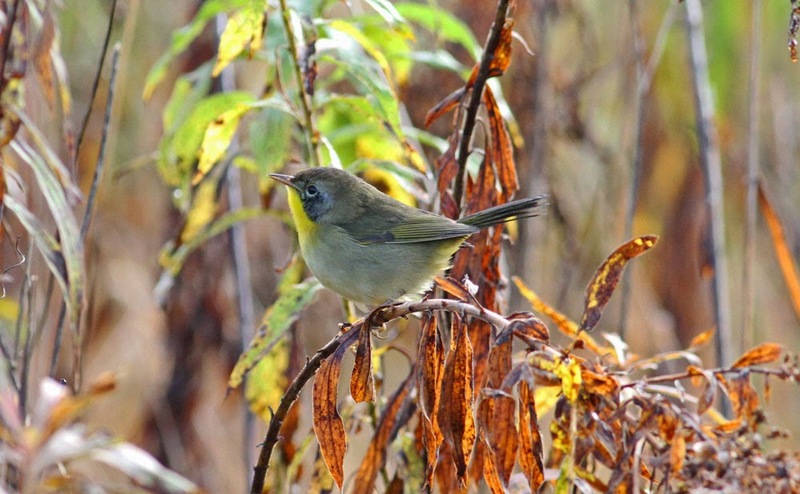 58) Common Yellowthroat - 1 (the last 'new' bird of the morning). Surprising misses included Mallard, Wild Turkey, Northern Mockingbird, Gray Catbird and Carolina Wren.....just to mention a few. With better weather and a few more eyes to help, a count of over 60 species might have been possible from this fantastic site.